Our “Feature Game” was to be Colosseum, which several people were keen to play, but there were two issues: it plays better with four than three, and always seems to take a lot longer than it should so we wanted to get going. We knew that Green was going to be late, but we didn’t know how late and that made a huge difference to our game plans for the evening; with six present already, should four get going and risk leaving two to play on their own all night if Green couldn’t make it at all in the end, or should we play something short together first and risk not having enough time for Colosseum? Texts were sent and there was much discussion including the inevitable mention of 6 Nimmt!, but aside from that we seemed to have few genuinely short fillers that would play six. Before we could actually make a decision, Green turned up and solved the problem for us and Burgundy and Blue started setting out Colosseum eventually joined by Blue, Pine and Magenta. The idea of the game is that each player is a Roman impresario, producing great spectacles in his or her arena in the hopes of attracting the most spectators. As such, the game comprises elements of auction, trading and planning with the ultimate goal of set collecting, where the sets represent groups of performers that have to match the program chosen. A complete program will attract its maximum number of spectators, where an incomplete program can cost players severely. There are several unusual aspects of the game, but the most obvious is the scoring; rather than summing the points during the game, a player’s final score is the number of points they scored for their most successful production, i.e. their most successful of the five rounds. Each round is broken down into several phases. First players can invest capital in improving their production, by for example, buying season tickets (which give a guaranteed five additional spectators for each subsequent round) or perhaps investing in a more expansive program which might increase the number of points available if it is completed successfully. Once all the players have improved their infrastructure, next they attend the market and bid for performers. The auctions are unusual in that each player has an opportunity to initiate an auction (i.e. choose which of the five sets are going to sold) and if they win, then the market is restocked, otherwise the next auction is chosen from fewer options. We decided to play what we thought was the original variant where each player can only win one auction; once they have won, they are then not able to bid on any later sales. However, on later inspection we discovered that thanks to the different variants available we had scrambled it slightly. Rereading the rules indicates that if a player loses an auction they initiated, they have the opportunity to try again, but with a smaller pool to choose from. In our auctions, each player was able to initiate just one auction, and if they won, the market was restocked and the next player had a go, whereas if they lost, they had to fight it out in a later auction. Auctions lead to all sorts of interesting dilemmas: is it better to bid and try to force someone to pay more, or is the risk of ending up with unwanted tiles too great? With our variant, we found that it was also sometimes better to let the initiator win because a better batch of tiles might come out, but failure to win an auction after initiating it was also a problem as it risked getting left with a choice of paying for unwanted tiles or getting nothing, which really added pressure. Given the relative shortage of tiles in the game, coming away with nothing is not really an option, but with a minimum bid of eight, the wrong tiles can be expensive. That said, the next phase is an opportunity to trade, and occasionally trading away something that is highly prized by others can turn out to be particularly productive. Like Settlers and Bohnanza, trades do not have to be symmetrical and must go through the active player, but in addition to trading tiles, money can also be used to sweeten a deal, or even buy an unwanted tile outright. Finally, players take it in turns to produce their spectacle. In order to do this, they roll a die (annotated with Roman numerals, obviously) which they can use to move one of the dignitaries, the Emperor, two Senators and three Consuls. These increase a players total for that round if they are in the arena when it is scored. If on the other hand, a player can move one of these characters onto a special “resting space” they get an “Emperor’s medal” as a reward. These can be traded in for money, the chance to move a dignitary forwards or backwards up to three spaces, three extra spectators or two can be used to get an extra investment opportunity at the start of the round. There are lots of components to the score of each production. Firstly there is the basic score associated with the program: this has a maximum potential value with points deducted for missing performers. To this, bonuses are added for season tickets, podiums (obtained for winning a round), star performers, dignitaries, previously completed event programs and Emperor medals. If this score is higher than the player’s previous highest total, their marker is moved to this new maximum and they receive that total in money. Once every player has completed their spectacle, a podium is handed out to the player who is in the lead and the player who is at the back takes a performer of their choice from the leading player’s pool. Finally, every player discards one performer token used in the round as “natural wastage”. Each player begins the game with two programs, a small one and a larger one. Pine started out with no performers that matched either of his and some that weren’t even available in the market, but everyone else had at least a small degree of overlap. The first round was a little tentative and Blue ended up as start player, so went first and invested in a season ticket. The early investments are critical as they continue to have an effect throughout the rest of the game. Magenta decided to do something different and expanded her arena, while Pine also picked up a season ticket and Burgundy opted for an Emperor’s Loge (pronounced “Lowj”). The Loge is an interesting investment as it doesn’t directly yield points. Instead, it allows the player to roll two dice and move one or two dignitaries just before producing their spectacle, potentially enabling players to gain more points that way. Burgundy had another plan though and forfeited the opportunity to take extra points, taking an emperors medal instead. As the most experienced player, he was of the opinion that the medals are really important. In the third and fourth rounds everyone was trying to get in a position for a big push in the final round. Magenta bought a season ticket instead of expanding her auditorium in the third round and therefore ended up in the same pickle that Blue had found herself in at the start. With only the one medal Magenta was unable to buy an extra investment opportunity which mean she was forced reproduce a medium event in the final round rather than buy a new large event. She went into the final round with the most money though which had the potential to guarantee her a good auction. Blue eschewed a new program in the fourth round, opting for another season ticket instead to try and set herself up for a big final round. Pine was very keen for a trade with Blue in the penultimate round, but as she had completed her program and still didn’t know what she was going to do in the final round she declined much to his disgust. Repeating a lower value production in the fourth round also ensured that Blue just finished last and was able to add insult to injury taking a valuable token from Pine who was well in the lead with a massive fourty-nine. With one round to go, Blue questioned whether Burgundy thought the Emperor’s Loge had been worth buying in the first round. He replied that the wisdom on boardgamegeek.com is that the medals are essential and because the Loge allows players to roll two dice they really help with that strategy. By this time, the value of the medals was becoming very obvious as trading in pairs enabled both Burgundy and Blue to make an extra investment which enabled Blue (start player again in the final round), to buy the most expensive, largest program (No. 30). Pine promptly followed by taking No. 28 and with his star performers and having so many podiums from the earlier rounds he looked in a good position, though he needed a lot of acts to complete his show. Blue was in a slightly better position with three “wilds”, but had very few bonuses.Blue went for the market she fancied most and Magenta decided to bid against her. Having not bought a large program in the final round, Magenta had far more money than anyone else and therefore the upper hand. Eventually, as money is only significant in a tie-breaker, Blue bid everything she had. Magenta, seeing other options of at least as great an interest to her decided to let her have it and Magenta took what she fancied, uncontested. While Pine and Burgundy were trying to work out which markets to take in order to do themselves the best favours, Blue looked at her options and Magenta’s. Since she Pine and Burgundy’s discussions were getting complex and could not involve her, Blue got bored and decided to see if Magenta would be interested in trading one of Blue’s “wilds” and an otherwise superfluous lion for one of her “green men” and a chariot. This would give both players one extra performer overall, and complete Magenta’s program, so she agreed. Thus, when Pine and Burgundy had finished thrashing out all the options, Blue and Magenta’s trade went through on the nod and it was only when Pine and Burgundy came to trying to further optimise their situations that they realised that Magenta had things they wanted, but nothing to offer her in return. Pine tried his best to get Magenta to trade, but she was steadfast that she wasn’t going to help him without getting something useful in return. Burgundy’s offer of two horses initially looked promising as he thought it would enable Magenta to take the star-turn bonus from Blue, but it would only give a tie, so ultimately, that trade was also unsuccessful. Blue moved a Senator into her arena and scored a total of eighty-two setting the bench-mark for everyone else. Although it sounded a lot, Blue didn’t think it would be quite enough and indeed it was very, very close, much closer than anyone had thought it would be. In the end, the Blue just had enough to finish four points ahead of Burgundy who was just two ahead of Pine who came in third. With the scores so very close, we had the inevitable review of the game and concluded that the the key moment was probably Blue taking the two wilds so cheaply in the second round, which would not have happened without the unintended rules revision. The other key moment was in the final round of negotiating when Blue and Magenta agreed their critical trade. Pine was verging on indignant that after playing for two and a half hours, it was essentially up to Magenta to choose the winner and suggested that should be the learning outcome for the week. Meanwhile, on the neighbouring table, Black and Purple had persuaded Green to join them playing one of their old favourites, Vikings. This is a fast economic game, but despite the nominal “Viking” theme there is none of the usual Norse Gods, exploration or pillaging involved. Black and Purple had come across it again recently after a long break and fancied giving it another outing. It is a game that we’ve not really played before in the group and Green was new to it too, but was willing to give it a ago. It is one of those games where the gameplay is not complicated and yet the explanation took ages. In summary, the game consists of six turns and on each turn, twelve tiles and twelve meeples are randomly drawn, paired together around a rondel. in each round, players take turns selecting a meeple/tile combination until they’re all taken. The tiles are pieces of islands and there are left ends, right ends and middle pieces. As players acquire these tiles, they are considering which sort of meeple would be placed on that tile, as each tile can hold only one meeple. The rules for placing these tiles are fairly straightforward, for example, a partial island can’t connect directly to open water, etc. The meeples come in five different colors and these colors denote their function in the game. For example, the yellow meeples are miners and they bring in money every turn; the red miners are nobles and they bring in two points apiece every time you score points, and so on. Once the tile selection and placement has been carried out, all the yellow meeples will make the players some money. On even turns, VP will be scored. At the end of the game, players can gain bonus points for completing the most islands and/or completing the largest island. It took Green a couple of rounds to work out how it all worked and ended up making a couple of little errors when laying out of his islands, which included not having an island space to place his gold Viking on and which meant he was able to get income, which was compounded by the bonus tile he had picked up which would enable him to gain an extra two coins for each gold Viking. In the meantime, Purple had a fair few noblemen who would not only score her well, but also enabled scoring for the large number of gold Vikings and fishermen below. She managed to avoid any ships in the first couple of rounds and so gained all the bonuses available to her. Black did have a number of ships, but he also had the warrior Vikings placed to combat them, so also gained a healthy bonus income. Green had a ship and a warrior, but both his scoring and income were low. After the first couple of rounds, the game progressed in pretty much the same pattern, except this time Green had sussed out what he was trying to do and regularly collected boatmen to redistribute his Vikings in time for scoring. However he was hampered by a lack of funds in the middle rounds, but when he finally got the gold guys out, he suddenly started to rake in the cash. This meant he was able to buy just what he needed in the final round, much to the others annoyance. By the end, Purple had a very red and yellow looking board and the longest island (six tiles long giving her five bonus points). Black had a huge fleet of ships, but most were covered by warriors and those that weren’t were not powerful enough to do much damage. He also had the most complete islands (seven which gave him a seven point bonus). Green had a relatively low scoring board, but he did have the most boatmen (giving ten bonus points). It had been a very poor game for fishermen, in fact, almost all the Vikings left in the bag were fishermen, so everyone was underfed, but Purple was less underfed than Black and Green. So in the final scoring Black had won through, beating Purple into second place (the first time she had not won this game for some time) and Green came in third, though much closer than he thought he would be. It was then that Black realised that Purple had forgotten to score her bonus island tile, which gave her a massive extra nine points, and with it, the win! We discussed the bonus tiles after the game and although the rules were not clear, we felt we had probably played it wrong. We only replaced the tiles that had been taken each round, rather than swiping them all and laying out a new lot. Since there were four tiles per round for six rounds and we had two piles of twelve, it looked like what was meant to happen was a new set each round. This would have made more choices available (and more bonus fishermen which would have been handy). Green decided that he liked this game very much and would be happy for Black and Purple to bring it again. The shows were still going on on the next table, so we needed another medium weight game and decided upon the cute Panda game, Takenoko. While setting up there was a short discussion on the evolutionary dead-end of the Panda and how on earth did such a creature ever evolve in the first place. Although since they are such cute creatures, we were glad they did and they had led to the clever little game. The play area starts with one single hexagonal “pond” tile with two characters on top: the Imperial Gardener and the Panda. On their turns players first determine the weather by a roll of the weather die, then perform their two actions. These actions must be different and the player can choose freely from the five available: add a new bamboo plot; take an irrigation channel (which can be played or stored for later use); move one of the characters (either the Imperial Gardener or the Panda), or draw an objective card and add it to their hand. The aim of the game is to earn points by completing objectives. When a player completes one of their objectives, they show everyone and the card is placed face up in front of them. Players can complete as many objectives as they like on their turn and end of the game is triggered when one player full-fills a set number of objectives. This game was a slightly unusual one as we all placed tiles in such a way that there was only ever one large field of each of the three colours and by half way, we all had mostly stopped laying tiles at all. In typical British style, the weather was mostly awful; wind; cloud; and rain. It was ages before the sun came out, but thereafter it made enough of an appearance to keep us all happy. Purple was the first to complete a mission card and Green wasn’t far behind, both tile pattern cards. The Panda and Gardener were mostly travelling between the pink and yellow fields, leaving the largely un-irrigated green fields untouched. This enabled Green and Purple to get some tower and bamboo chomping bonus cards, but Black was beginning to fall behind. His problem was that all his bonus cards were low scoring. He kept using his actions to take more bonus cards, but they always seemed to be low scoring, and unless he could get more points out of it he wasn’t going to win. He completed a few objectives on the way, but didn’t want to fill all of his eight with low scoring objectives so held back on claiming some. In the meantime, Green was rapidly claiming bonuses, mostly towers giving a healthy haul of points. Purple made a few miscalculations on which bamboos would grow and by how much and thus failed to get a card or two that she had planned. Learning Outcome: Even after playing for two and a half hours, sometimes Magenta still gets to choose the winner. This entry was posted in Games Night and tagged 6 Nimmt!, Bohnanza, Colosseum, Takenoko, The Settlers of Catan, Vikings on May 3, 2016 by nannyGOAT. The “Brilliant Maps” Blog recently listed what it considered “The 28 Best Map Based Strategy Board Games You’ve Probably Never Played“. Leaving aside the fact that most dedicated gamers will have played many of them, how valid is this list? On closer inspection it turns out that the list is really just the top twenty-eight games listed on BoardGameGeek.com (BGG) that happen to have a map for the board. As such, it makes no subjective judgement on the quality of the map and is simply a list of the best games according to BoardGameGeek that feature a map. For example, the game with the highest rating on BoardGameGeek.com is Twilight Struggle which is a Euro/war game hybrid and is therefore played on a map. The map is not particularly picturesque, however, though for those old enough to remember, its spartan nature is strongly evocative of the Cold War setting. Is it a great map though? It certainly captures the theme of the game and perhaps, as such, it is indeed a great map. Unsurprisingly, many of the games mentioned are war games. There are a fair number of Euro games too though: high on the list are Terra Mystica at number two, Brass at four and Power Grid at six. Number ten on the list is Concordia and eleven is El Grande – a game that is celebrating its twentieth anniversary this year. Further down are Tigris and Euphrates, Steam, Pandemic, Ticket to Ride: Europe, Carcassonne and finally, just sneaking onto the list, The Settlers of Catan (or Catan as we are now supposed to call it). All these games indeed include maps of some description, but overwhelmingly, they are also all well-established “classic” games. Are they the best maps though? There are some stunningly beautiful games that haven’t made the list, for example, Amerigo is played on a beautiful seascape and Lancaster includes a lovely map of the England. How do we define “map-based game” however? Clearly, a map is is a two-dimensional play space so that excludes games where the play-area is predominantly linear i.e. “a track”. But what about games where the map is produced as the game is played? If Carcassonne is considered a map game, other games where the board is built during the play should also be included, like Saboteur and Takenoko. What about one of our favourite games at boardGOATS, Keyflower? 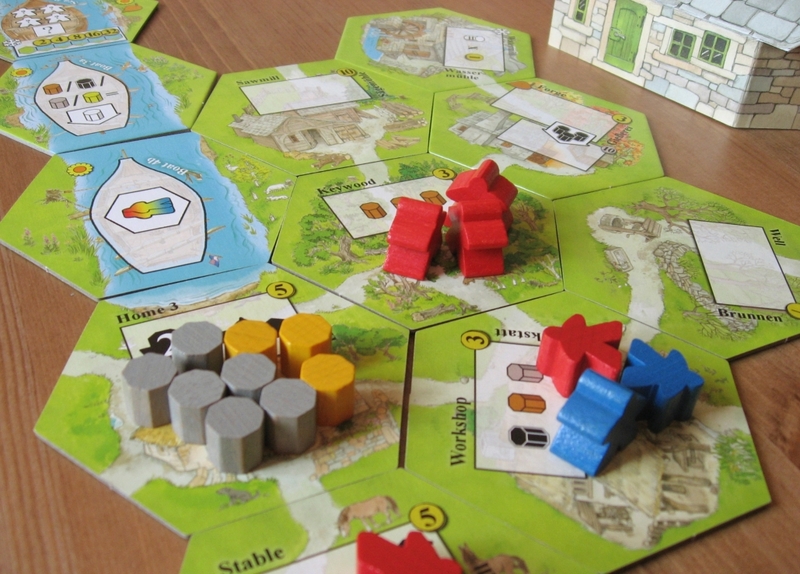 In this game, players buy tiles and then use them to build their own personal little village map. Should this be included too? Ultimately, none of this really matters of course: a game is a game and it all comes down to how much people enjoy playing it. One thing is clear though, while a game can be good in spite of the rendering, playing with beautiful components can only enhance the boardgame experience. This entry was posted in News and tagged Amerigo, Brass: Lancashire, Carcassonne, Concordia, El Grande, Keyflower, Lancaster, Pandemic, Power Grid, Saboteur, Steam, Takenoko, Terra Mystica, The Settlers of Catan, Ticket to Ride, Ticket to Ride: Europe, Tigris and Euphrates, Twilight Struggle on September 4, 2015 by nannyGOAT. This is the 200th post on our website! We get 17% of our views on a Tuesday which presumably reflects that we meet on a Tuesday evening, however, the intersection of that group and the 11% who view the site at around 10pm must be sorry to find out they’ve missed most of it! This entry was posted in News and tagged Takenoko on July 22, 2015 by nannyGOAT.